UPDATE: Please note that due to high demand, the value of the Altheta gift certificate has been revised from $50 to $25 and is available to the first 500 redemptions. Now that the lawn is open, we're releasing information about the summer's signature lawn events. Yesterday, we released the full lineup of HBO Bryant Park Summer Film Fest screenings. Today, we announce the return of another beloved series with some exciting news. We are thrilled to announce that Bryant Park Yoga begins on Tuesday, May 20th, for its 11th year in the park. Our sponsor Athleta is bringing back its signature bright mats--this year's colors are orange and pink--so there's no need to bring your own. As in years past, this year's classes are taught by instructors from YogaWorks. Our classes will run on Tuesdays from 10am to 11am and on Thursdays from 6pm to 7pm. Reserve your spot (http://yoga.bryantpark.org) or drop in. Over 650 attendees practice triangle pose. You come to yoga faithfully, so you should be rewarded. Introducing the Frequent Yogi Program. 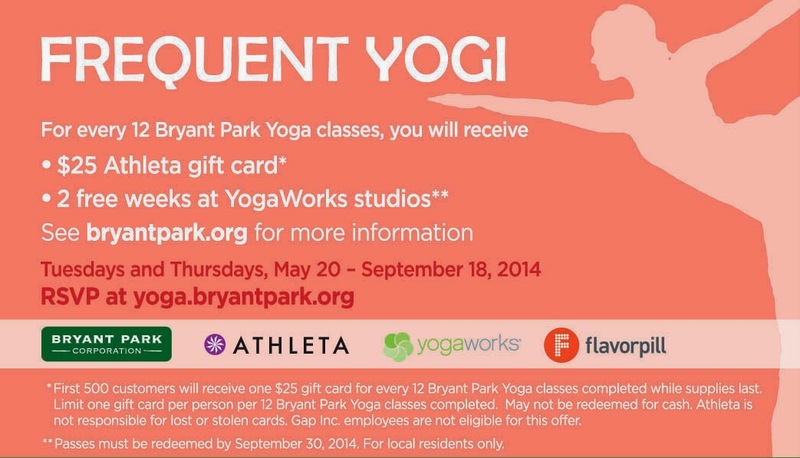 Get twelve stamps on your card and receive a $50 $25 gift certificate to Athleta AND two weeks free at YogaWorks. 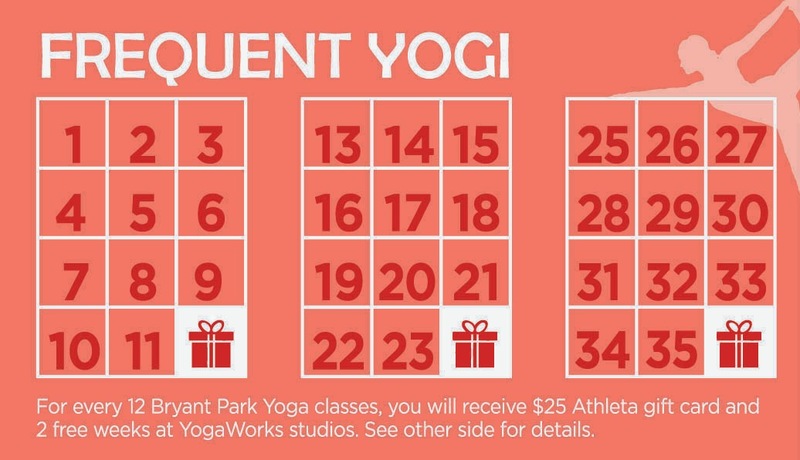 With 36 classes this summer, you can rack up $150 $75 at our favorite women's athletic outfitter and six free weeks at the city's premiere yoga studio! Another addition to this year's lineup is the addition of Flavorpill as a media sponsor. We say it every year, but we really mean it: this will be our best year ever! The front and back of the most important card in your wallet this summer. Its good to see that so many people attending yoga and trying to stay fit and healthy.